Identification of Actionable Gene Mutations in L-HES. Figure 1. 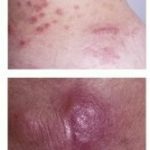 Clinical Pictures of Skin Papules and Nodules in a Case of L-HES. Hypereosinophilic syndrome is a heterogeneous group of disorders characterized by hypereosinophilia and eosinophil-mediated end-organ damage. In the lymphocytic variant of HES (L-HES), the disorder is caused by a T cell clone that produces pathogenic levels of eosinophil-promoting cytokines. In a recent manuscript published in Blood, we identified STAT3 signaling as a driver of L-HES. These studies provided the scientific rationale for a study at Yale to treat L-HES patients with JAK inhibitors. Preliminary studies suggest that JAK inhibitors are highly efficacious for patients with this disease. CTCL is commonly associated with L-HES but the patients we studied did not have CTCL.